#AP #LAWCET 2019 Notification, Schedule, Online Application Form, How to Apply, Fee Details, Last Date, Onine AP LAWCET Exam date, Hall Tickets, Results, Admission Counseling details are given here. AP LAWCET 2019 Sri Krishnadevaraya University, Ananthapuramu, Andhra Pradesh will issue the Law Common Entrance Test-2019 (LAWCET 2019). This entrance test for entry into three year or five LLB / B.L Regular and Self Financing Courses in the Colleges of Law in Andhra Pradesh State for the academic year 2019-2020. 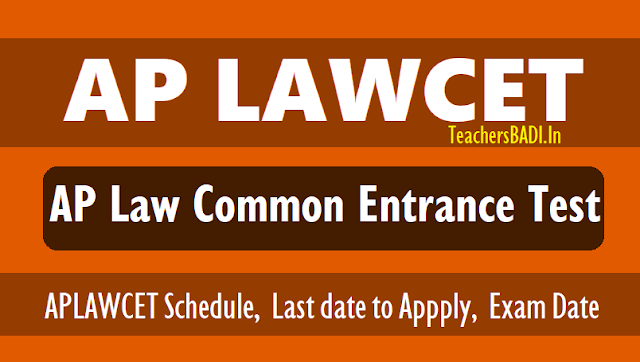 The Law Common Entrance Test 2019(LAWCET-2019) will be conducted by the Convenor, Department of Law, Sri Krishnadevaraya University, Ananthapuramu, Andhra Pradesh on behalf of Andhra Pradesh State Council of Higher Education(APSCHE), Hyderabad. Late applicants will need to pay late fee depending on the time frame of the application and the exam scheduled in April, while the results will be out in April. LAWCET officials will be invited Online Applications from eligible Candidates for admission into LLB / B.L courses offered by state Universities in Andhra Pradesh State including their Affiliated Colleges. 3 year LL.B Course: The Candidates for 3 year LL.B. should have passed any Graduate Degree (10+2+3 pattern) of a recognized University with 45% of aggregate marks or any other examination recognized as equivalent by the Universities concerned. If any candidate secured less than 45% in graduation he should have passed any additional graduation or post graduation with 45%. 5 Year LL.B. Course: The Candidates for 5 year LL.B. should have passed two year Intermediate Examination (10+2 pattern) with 45% of aggregate marks or any other examination recognized as equivalent by the University concerned or the Board of Intermediate Education, A.P. Candidates can apply through online mode. Candidates who wish to apply for Andhra Pradesh LAWCET 2019 are requested to fill the particulars carefully in ONLINE APPLICATION. The required information should be collected from the relevant documents.